I camp at Iceberg Lake just below Mt. Whitney. Nearby are three Brits carrying some serious climbing equipment, and two Canadians with a guide. There is no wind, but it is cold. When it is already 36 degrees at sunset, you know you are in for a cold night. 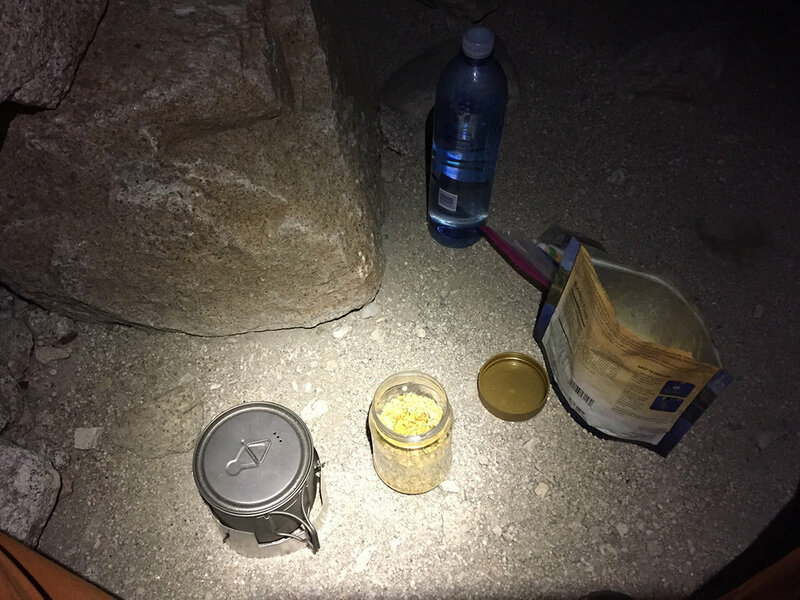 My new cooking setup is light; a 550ml titanium Toaks pot, DIY aluminum windscreen, Esbit fuel tablet holder, repurposed plastic peanut butter jar, repurposed food sleeve, polycarbonate long spoon, total: 6 oz. I average a miniscule .75 oz of fuel each day. The tallest peak is Mt. Whitney (14,505 ft), and the Mountaineer's Route that I will take is the chute to the right side. Excellent mirror lake photo opportunities at Iceberg Lake. I sleep in one of the many rock circles at the lake even though I do not need wind protection. I think that all the circles should be taken apart and the rocks scattered; they are curious but too much of an imposition on the natural landscape. As a former cartographer I love Google Earth and the ability to fly around places I hike. This view shows my tracks with Mt. Russell on the right and Mt. Whitney on the left with its "aiguilles", which is a French term for a rock mass shaped like a needle. There are options for how to ascend the chute. I prefer climbing the rock mass on the left instead of the loose rock in the middle. View looking back at Iceberg Lake with three young people doing a day ascent. View near the top of the chute. My young friends pass by; I am twice their age and am carrying a full albeit light pack. 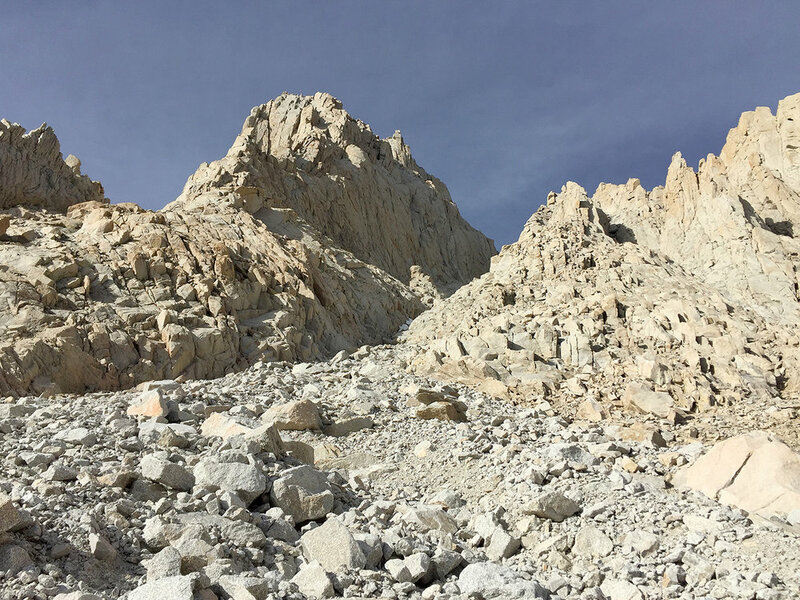 One more rock section to climb and I make it to the top of Whitney to see the distinctive hut where I high-five with my young friends. At the summit edge there are several dudes and dudettes, not all ebullient. Lots of talk about drinking Red Bull, bad headaches and vomiting. More rock circles. Really, this rock circle thing is out of control. View to the South and the rest of my route; Mt. Muir along the ridge, and Mt. Langley is the high plateau in the more distant left. Four peaks down, two more left. The aiguilles along the ridge are fascinating forms. The Whitney trail is much improved since my last visit, with no trail blowouts and some fancy new trail construction. This Google Earth view shows my GPS tracks generated from the GAIA app on my iPhone and are very detailed. One can see that rock scrambling is not a straight-line activity! The foreground red mark is Mt. Whitney, the rear red mark is Mt. Muir. I did some advance reading on Mt. Muir (14,018 ft) and while listed at Class 3, there are a few spots with "scary exposure" and some suggestions of how to go up. The approach to the relatively small climb is easily reached by leaving the Whitney trail only a small distance. For the second part of my trip I switched to my La Sportiva Wildcat trail shoes. Yes, they are lighter and breathe better than the TX3 approach shoes for trail use, but they are not as "sticky" on the rocks, to my regret. I am most of the way up Mt. Muir and I arrive at this rock. The crack up the left side is too exposed; the leap up and walk across the mantle in the middle is also too exposed with virtually no handholds; the crack up the right is doable but means hanging off the top of the rock while moving left across the rock which is sort of ok except I can't see where it concludes. The combination of tiredness and my lack of confidence in my shoes influence my decision to turn back and descend, only a few feet from the summit. I'll return some day. They say there is honor in an unsuccessful attempt. Between Mt. Muir and Mt. Russell I am gaining lots of honor on this trip. I walk a bit longer on the Whitney trail and then peel off south over a pass and down this long and very vertical scree field. Scree-skiing is not hard if you have good ankles and knees like I do, but finding the correct path does take some judgement. Towards the middle I find the diagonal slash that allows me to descend the almost vertical rock area. It is late and I will camp next to a barren lake. I am reading The Other Side of the Mountain: Mujahideen Tactics in the Soviet-Afghan War, which is an account of how the Mujahideen fought a guerilla war against the vastly superior Soviets in part by using their intimate knowledge of the land to ambush the Soviet convoys into "kill-zones". The early morning photo of the lake is very pretty, but the entire area feels hostile like a kill-zone and I want to leave as soon as I can. Just over the next pass I enter the Miter Basin and it is a much friendlier place with a series of lakes. This lake warrants an hour of appreciation. The jet salutes me and I salute back. This lonely small tree is the only tree at this elevation, easily 500 feet above the treeline. Global warming may be raising the treeline and this tree may be the harbinger. What is my backpack doing way down there? I am cutting a very straight cross-country path across rocks with some aggressive climbing, and I come to this rock with a five-foot drop which is just a little too much to jump wearing the backpack. Normally the thing to do is to let down the backpack separately with a rope. I am lazy and instead drop my backpack hoping for a soft landing on the bush. However my backpack is light and the bush is springy so the backpack trampolines off the bush and I helplessly watch it bounce down the hill. So how much damage? My new 7 oz Vapor helmet took some scrapes but is not structurally impaired, and the bear canister cut a hole in the pack. Not too bad. My CG (Computer Graphics) friends would kill to produce a visual effect this good. I welcome the return to a place with some foliage and color. Lunch, a nap, good weather, life is good. This strange looking plant is as soft as it appears. I love seeing wild animals in their habitat and I don't understand the impulse to shoot these beautiful creatures. I drop my pack to camp a bit early today at the highest point in the treeline, ready to ascend Mt. Langley and conclude my hike tomorrow. I am up early onto Army Pass and get an early morning shadow selfie. Aliens transported Imhotep here to build this rock wall. The walk to Mt. Langley (14,026 ft) is mostly just that, a walk. Mostly. I have never seen a sign concerning rock cairns. I then begin to see large pyramidal constructions that seem much more substantial than "cairns". I then understand: the line of "cairns" is the officially sanctioned route up the mountain. Random pieces of white quartz are found sprinkled across the landscape. The marker on the top of Mt. Langley. The top of Langley features some odd rocks, similar to Whitney. I descend and decide to take the "shortcut" path down Army Pass. I can see why the rangers advise taking the "New Army Pass" trail instead of Army Pass. The top of the rock wall is very vertical and the trail can be blown-out at any moment by falling rocks. It is comforting to be around lakes and grass again. 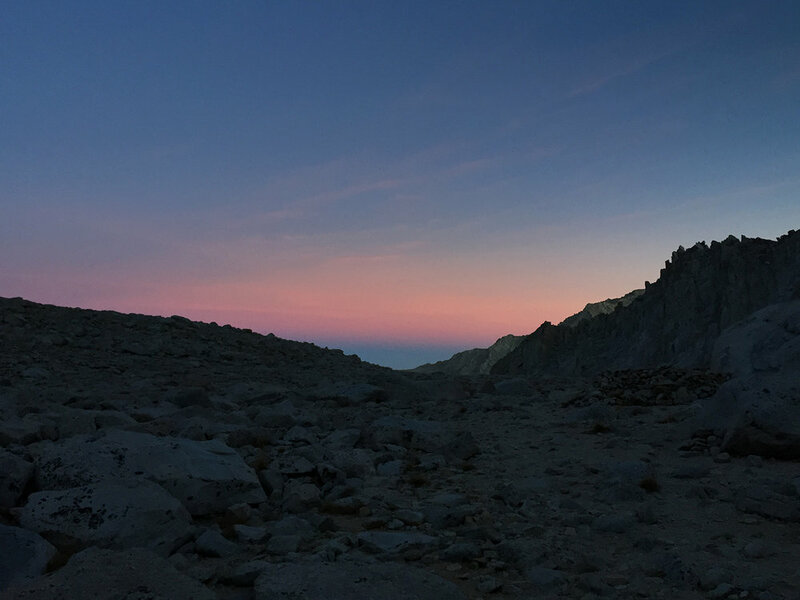 I descend to Lone Pine, my adventure concluded. I plan to take more High Sierra cross country routes next summer. I enjoy engaging the land in a different way, the solitude and the challenge. I also enjoy climbing successive peaks and obtaining expansive views, and may expand this activity to include walking the crestlines between peaks. This kind of effort is mentally and physically fatiguing and it is best done interspersed with rest time or at least time on a trail at slightly lower altitudes where the landscape is less extreme and there is flora and fauna. This experience has changed me and I am grateful to have the ability to take advantage of it.